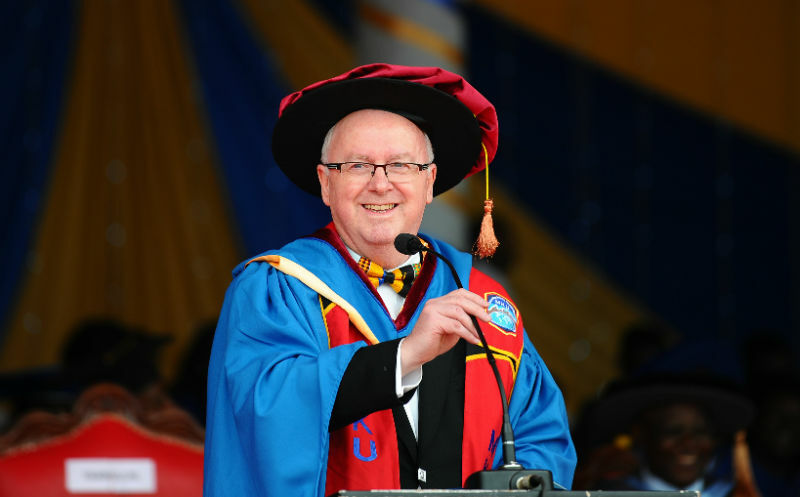 University of the West of Scotland’s (UWS) Professor John Struthers, from the School of Business and Enterprise, has been ahttps://universitybusiness.co.uk/Article/stemming-the-graduate-brain-drain-through-entrepreneurshipppointed as the Chancellor of Mount Kenya University. Professor Struthers will preside over the Kenyan university’s twice yearly graduation ceremonies as part of this prestigious role. With over 40 years’ experience in higher education in the UK and Africa, John is also Director of the Centre for African Research on and Economic Development (CAREED), which he helped co-found at UWS in 2015, specialising in a range of economics topics across the continent of Africa. 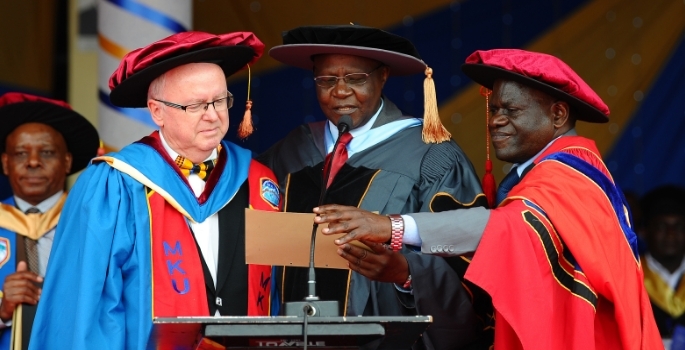 The installation of John as Chancellor took place during the university’s fourteenth graduation ceremony held on 3 August which saw around 6,100 graduates in attendance accompanied by their parents and guardians as well as invited guests of the university bringing attendance to around 40,000. The ceremony aired live on Kenya’s national TV station. He is also a member of the Westminster Africa Business Group in London and has worked in Nigeria and Sierra Leone, as well as carrying out research in Ghana and Ethiopia. He succeeds the first Chancellor of Mount Kenya University, Professor Victoria Wulsin of the University of Cincinnati. The graduation ceremony took place at the university’s main campus in Thika, a town about 40 kilometres north of Nairobi. The university has expanded in recent years to include a campus in Rwanda in addition to the many campuses across Kenya itself. It is one of the largest private universities in East Africa with more than 40,000 students following a wide range of academic programmes up to doctoral level.